Right at this minute, I just don't have the brain space for anything more complicated, so I thought I'd share a fleeting snapshot of my life. Follow me on Instagram for more! ONE: The amazing first course at the first Guerilla Gourmet Supper Club in Dublin; a new pop up dining experience dreamed up by restaurant critic Ross Golden-Bannon with Robert Lee Mulcahy. The menu was created with the insanely talented chef, Gareth Mullins, from Dublin's newset 5 Star hotel The Marker. TWO: And reason #2 I love Chef Gareth: I present to you the cronut. This hybrid donut and croissant is the latest craze sweeping New York and for once Ireland's ahead of the pastry curve. Being part of this piece in the Daily Edge really tickled me - go on and give it a read. THREE: While visiting The Marker I took a sneak peek at their spa area and OMG people, OM freakin' G. We're talking a seriously luxe cocoon of warmth and relaxation, complete with this gorgous dark tiled pool. I'm making it my mission to pay them a proper visit soon. FIVE: But for now I'll leave you with this teaser shot - a gorgeous jewelled clutch from Olga Berg. I fell in love. SIX: I've been rocking Dior's summer nail duo in Samba all week long. SEVEN: And trying to avoid the tasty treats rolling into the office for the dot conf. EIGHT: Work's been too crazy to get to any events, but for the relaunch of this fella I just had to be there. It's Clinique's Dramatically Different Moisturiser, and after 45 years, it's been reformulated and relaunched. Watch this space for a full review. NINE: And the cutest beauty bits to land on my desk this week? These pretty tinted Burts Bees balms are just adorable - I'll write about them soon. And I cannot believe Ireland has cronuts! WHY didn't I come home earlier? HAHA Emma! I'm brain dead too. LOL It's the end of the week. I'll take those Dior nail lacquers and that fruit. Have a great weekend! I feel a bit like that today too Emma & I have such a busy day ahead! TGIF! I loved seeing this little glimpse into your week, sounds like you definitely had a busy one! Cronuts? Where have they been all my life, I have to try them! Your clutch bag looks fantastic, love the Dior polishes too, so summery. Hope you have a great weekend Emma, they always go too fast! Hmmm look at all that fresh fruit! Happy Friday Emma! Wow I can't believe Cronut mania has spread to Ireland already. The daily lines in NYC for them is insane! Great pics! I'd prefer the fruit to the choc treats. 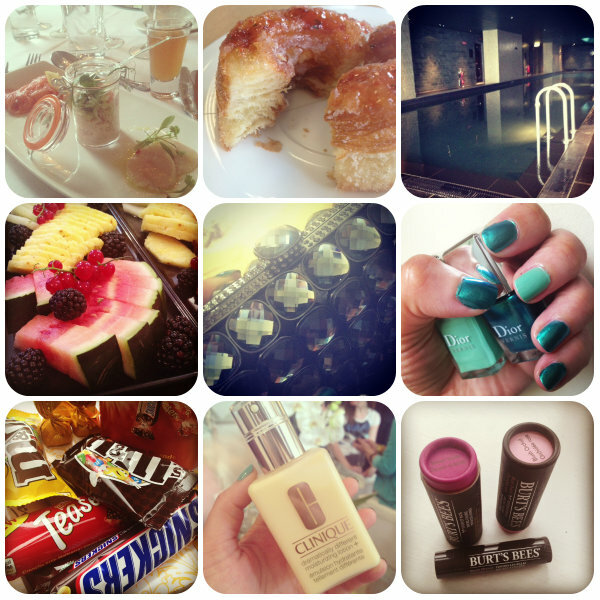 Loving the green shaded nails, great pic roundup! I really want those dior polishes they are lovely colours! I have the clinique moisturiser i really like it.